The 2019 Spring Melt is on! 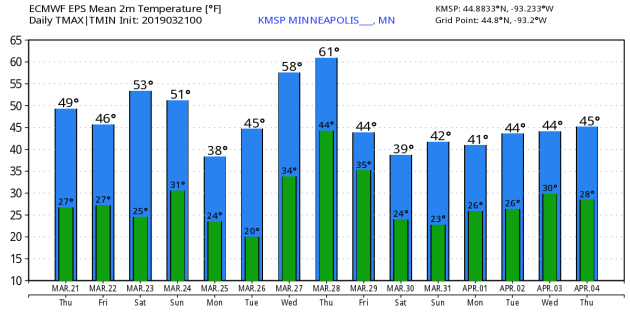 First 50F of the Season at MSP on Thursday!! Well, how about that! MSP finally warmed to 50F for the first time this season and the first time since November 1st! Keep in mind that the average first 50F is in early March, however, the latest was on April 17th set in 1962. The earliest 50F temp was January 7th, set in 2003. "Spring Outlook: Historic, widespread flooding to continue through May"
"Above-average spring rain and snow will worsen flood conditions. Nearly two-thirds of the Lower 48 states face an elevated risk for flooding through May, with the potential for major or moderate flooding in 25 states, according to NOAA’s U.S. Spring Outlook issued today. The majority of the country is favored to experience above-average precipitation this spring, increasing the flood risk. Portions of the United States – especially in the upper Mississippi and Missouri River basins including Nebraska, Minnesota and Iowa – have already experienced record flooding this year. This early flooding was caused by rapid snow melt combined with heavy spring rain and late season snowfall in areas where soil moisture is high. In some areas, ice jams are exacerbating the flooding. Offices across the National Weather Service have been working with local communities, providing decision-support services and special briefings to emergency managers and other leaders in local, state and federal government to ensure the highest level of readiness before the flooding began. Additional spring rain and melting snow will prolong and expand flooding, especially in the central and southern U.S. As this excess water flows downstream through the river basins, the flood threat will become worse and geographically more widespread." The National Weather Service has issued a number of flood warnings for rivers across the southern half of the state. Keep in mind that some locations aren't quiet yet at flood stage, but river levels are forecast to rise significantly over the next several days/weeks as the signifcant snow pack continues to melt and as the runoff enters the water systems. Again, despite not see much in the way of major flooding close to home, a significant rise in river levels is expected over the next several days and weeks. Therefore, the Twin Cities has issued a number of flood warnings along area rivers in advance of the expected flooding. Stay vigilant and prepare now! Here is the latest river gauge (and forecast) for the Mississippi River at St. Paul. Note that as of Thursday, river levels were still below flooding, but we should see this enter minor flood stage over the weekend and into major flood stage by the middle of next week! The expected rise is nearly 10ft. within the next 5 to 7 days. High temps on Friday will be pretty close to aveage for this time of the year with highs ranging from the mid/upper 30s across the northern part of the state to the low/mid 40s across the southern half of the state. According to the GEFS and ECMWF Ensemble models, temps will be trending warmer as we head through the last week and a half of March. Note that temps look to warm into the 50s over the weekend, which will be above average for a change. In fact, these will be some of the first 50s that we've seen since November 1st! The extended outlook suggests a potential first 60F of the season by the end of next week! We'll have to wait and see how things shake out, but according to the ECMWF, we may start April on a cooler than average note with highs in the 40s. The average high for the MSP Airport on April 1st is 50F and that's no joke! Just a reminder that March is our 3rd snowiest month of the year averaging 10.3" !! So far this month, we've had 10.5", so we are officially above average! Note that the snowiest March in recorded history was 40.0" set in 1951. Looking ahead, I don't think we have to worry about any more snow records as temps look to gradually warm into the 40s, 50s and possibly even 60s through the 2nd half of the month! March came in like a lion with areas of heavy snow and rain. Through the first half of the month, the Twin Cities has picked up nearly 2" of liquid, while folks in the southwestern part of the state have seen nearly 3" to 4" of liquid! With that said, most locations across the state are dealing with above average precipitation through the first 3 weeks of March. Well, thanks to a very active February and early half of March, our seasonal snowfall tallies are sitting at some pretty impressive tallies. Keep in mind that prior to February 5th, the Twin Cities was nearly 18" below average snowfall this season. The weather pattern quickly turned and within a 34 day period, the Twin Cities saw nearly 50" of snow! 39" of record snow fell at the MSP Airport in February, and we've already had 10.4" of snow through the first half of March. Here's an interesting stat, from February 5th to March 10th, the Twin Cities had 49.3" of snow, which is the 20th snowiest 34 day stretch in MSP history! At any rate, most reporting station around the region are in double digits reading above average snowfall for the season so far! The Twin Cities is nearly 20" above average, while Eau Claire, WI is nearly 46" above average - unreal! Note that the Twin Cities has seen 67.3" of snow so far this season, which the 22nd snowiest season on record. 67.3" of snow has fallen this season at the MSP Airport, which is the 22nd snowiest season on record! 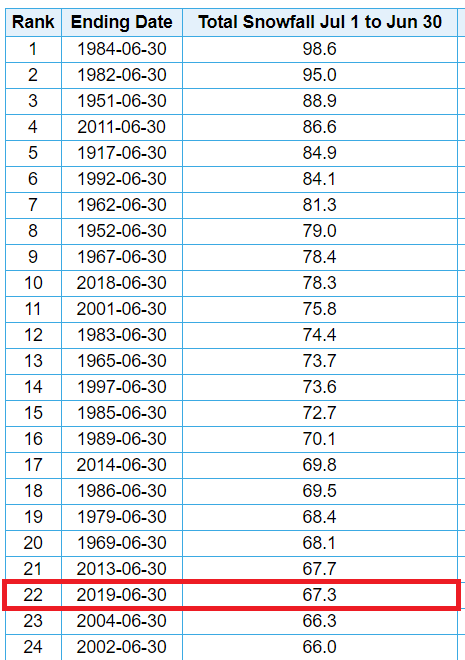 Note that the snowiest season was during the 1983-1984 when 98.6" of snow fell! Here's the latest snow depth from across the region. Keep in mind that on Sunday, March 10th, the Twin Cities still had 19" of snow on the ground. A week and a half later, that number has dwindled to just a trace! However, folks in parts of northern Minnesota still have nearly 1 to 2 feet of snow on the ground. After a very quiet week, things could get a little soggy by Sunday. At this point, it doesn't look like much, but a few showers could push through the region late weekend and could even mix with a few wet flakes across parts of central and northern MN. 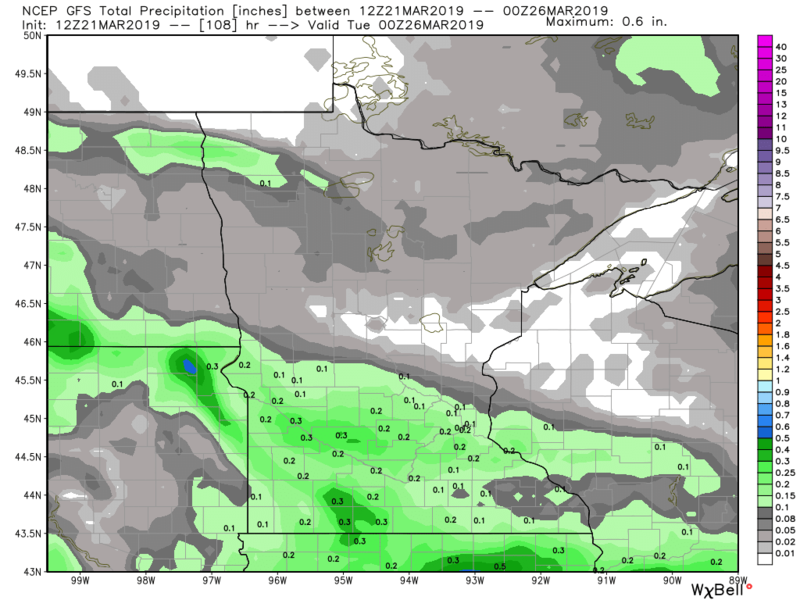 According to the GFS, there could be up to a few tenths of an inch of rain across parts of southern Minnesota as our next system moves in late weekend. Again, it doesn't look like a terrible amount, but it will help speed up the melting process. Here's the temperature anomaly as we head through the 2nd to last weekend of the month. Note that temps look to be warmer than average to start, but we could head back to below average readings by early next week. According to NOAA's CPC, the temperature outlook from March 29th - April 4th suggests cooler than average temps returning to the Upper Midwest as we slide into the end of the month/early part of April. 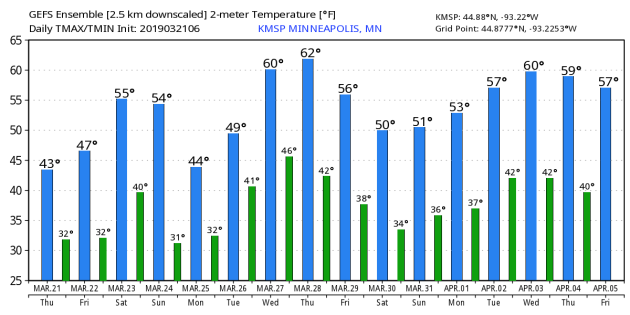 However, keep in mind that the average temp in the Twin Cities on April 1st is 50F, so even though temps may be a little below, it won't be anything too nasty. 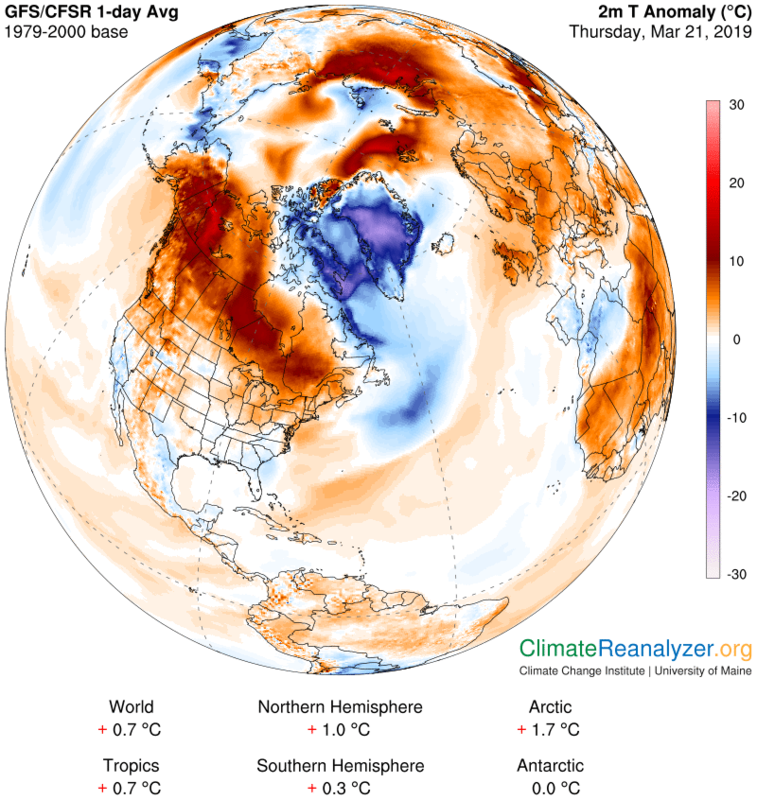 "March 18, 2019 - Spring leaf out is spreading north through Southwest, Southeast, and mid-Atlantic states. Spring leaf out is 1-2 weeks early in parts of the Southeast and California and 2-3 weeks late in parts of Washington and Oregon and the Southern Great Plains. Spring is one week late in St. Louis and four days late in Washington DC. Spring bloom has arrived on time to 2 weeks early in much of the South. Jackson, MS is 10 days early. Parts of Arizona and California are 1-2 weeks late." Drip... drip... drip... That's the sound of the Old Man Winter loosening his grip on the Upper Midwest. Birds have begun their spring songs, maple trees have been tapped for maple syrup and rivers have started to rise as the 2019 spring flood season begins. NOAA's 2019 Spring Flood Outlook, released yesterday, stated that "This is shaping up to be a potentially unprecedented flood season, with more than 200 million people at risk for flooding across the nation." It also stated that "The areas of greatest risk of moderate to major flooding include the Mississippi and Red River basins." Keep in mind that some locations have lost nearly 1 to 2 feet of snow in the last week and a half and there's still a lot of snow left across much of central and northern Minnesota. River levels are already on the rise and will likely crest in early April close to home. However, latest forecasts suggest that metro rivers will reach flood stage in the next 5 to 7 days, some even at major flood levels. Pray that heavy rains won't make matters worse. FRIDAY: Bright sunshine. Winds: NNE 5. High: 46. FRIDAY NIGHT: Partly cloudy and quiet. Winds: N 5. Low: 25. SATURDAY: Distractingly nice. Winds: SSW 5-10. High: 54. SUNDAY: Light rain showers with a few wet flakes. Winds: ENE 5-10. Wake-up: 32 High: 51. MONDAY: Gradual clearing. Not as mild. Winds: ESE 5-10. Wake-up: 25. High: 40. TUESDAY: A bit breezy. More clouds late. Winds: S 10-20. Wake-up: 22. High: 47. WEDNESDAY: Mostly cloudy. Isolated sprinkles. Winds: S 7-12. Wake-up: 34. High: 57. THURSDAY: Twins Home Opener. PM showers? Winds: NE 5-10. Wake-up: 44. High: 60. 1953: A tornado hits the northern St. Cloud area. High winds from thunderstorms are experienced from Martin to Stearns County. "The weeks around the spring equinox are best for viewing the zodiacal light in the evening. Now that the moon has left the early evening sky, the next several weeks present an excellent time for those in the Northern Hemisphere to view this mysterious light, which looks like a hazy pyramid extending up from the western horizon, when all traces of twilight have let the evening sky. You’ll want a rural location, as full darkness falls. About 80 to 120 minutes after sunset should be about right. Southern Hemisphere? It’s your best time of year to see the zodiacal light in the morning, in the east just before dawn. A bright moon is up before dawn in late March. If you’re in the Southern Hemisphere, consider waiting until early April 2019 – when the moon has waned to a thin crescent or left the morning sky entirely – to look for the zodiacal light before dawn. This observation is not for city dwellers. But if you find yourself beneath a dark country sky – or perhaps driving along a country road when the time is right – look for this eerie light." High temps across the country on Friday will be below average in many locations with the exception of the southern US and the Northwest. The good news is that the worst of winter's Arctic chill is behind us! The weather outlook as we head into the weekend ahead suggests areas of heavy rain and snow wrapping up in the Northwest, while another surge of Pacific moisture will move into the Western half of the country. Areas of heavy rain and snow will be possible west of the Rockies, while a few isolated strong/severe storms can't be ruled out in the Oklahoma and Texas Panhandle on Friday. According to NOAA's WPC, the 7 day precipitation forecast suggests more widespread precipitation across the country as we through most of next week. Some of the heaviest precipitation will be found across the northern half of California, including the Sierra Nevada Range. There will also be pockets of heavy precipitation in the Northern New England States, where areas of heavy rain and snow will be possible through the early weekend time frame. "Flood Damage to Midwestern Levees, Roads, Farms May Run Well into the Billions"
"Costs are mounting quickly from the late-winter/early-spring flood disaster that’s assaulted the Midwest this month. Estimates from several disparate sources now suggest that the total cost of the flooding to date—including agricultural losses, road repair, and levee reconstruction—could end up in the multiple-billions-of-dollars range. At least three deaths have been linked to the flooding. Nebraska Governor Pete Ricketts told reporters on Wednesday that preliminary damage estimates in his state alone are more than $1.3 billion, including $439 million in infrastructure losses, $85 million in private homes and business losses, $400 million in livestock and $440 million in crop losses. The total does not apparently include damage to Offutt Air Force Base, where floodwaters covered about one third of the area and inundated dozens of buildings. To make matters worse, the Midwest is highly vulnerable to more flooding this spring, thanks to saturated soil and a large snowpack in the Upper Midwest." "Africa’s Hurricane Katrina: Tropical Cyclone Idai Causes an Extreme Catastrophe"
"Over 400 are dead and countless more are at grave risk, huddled on rooftops or clinging to trees, in the horrifying aftermath of Tropical Cyclone Idai in Mozambique. In scenes reminiscent of Hurricane Katrina in New Orleans in 2005, aerial survey teams photographed thousands of marooned people in the “inland ocean” up to 30 miles wide that heavy rains from Idai have created in central Mozambique. Tropical Cyclone Idai made landfall on Thursday evening as a Category 2 storm with 110 mph winds just north of Beira, Mozambique (population 530,000) near the time of high tide, driving a devastating storm surge into the city. The cyclone also caused enormous wind damage, ripping off hundreds of roofs in Mozambique’s fourth largest city. Since the cyclone was large and moving slowly at landfall, near 6 mph, it was a prodigious rainmaker, with satellite-estimated rainfall amounts in excess of 2 feet in much of central Mozambique. Idai stalled and died over the high terrain along the Zimbabwe-Mozambique border on Saturday, but Idai’s remains hovered over the region through Tuesday, bringing additional heavy rains--over a foot in eastern Zimbabwe. Runoff from these rains have submerged huge portions of central Mozambique. Damage to improverished Mozambique, whose GDP is just $12 billion, will be many billions of dollars and take more than five years to recover from." "What's Behind the Massive Midwestern Floods: 2 Giant Waves of Water"
"Historic floods across the Midwest have left three dead, prompted mass evacuations, and drowned cities. The floods aren’t isolated incidents, however: Two giant waves of water are rolling down from the country's far-northern middle expanse. One wave is following the path of the Missouri River toward the Mississippi River, carrying with it big chunks of ice. The second wave is taking a similar path down the Mississippi River from Minnesota. Both are the result of a long winter of heavy snowfall in Minnesota and the Dakotas followed by a short, sharp melt. Both floods are more or less each one giant wave traveling at the speeds of their rivers, said Darone Jones, director of the Water Prediction Operations Division (WPOD) at the National Weather Service’s National Water Center (NWC) in Alabama." "NASA photos capture immense flooding of a vital U.S. Air Force base"
"In 1948, Air Force Secretary Stuart Symington stationed the United States' long-range nuclear bombers at Offutt Air Force Base in eastern Nebraska, a location safe in the middle of the nation and well-insulated from the coast. But 70 years later, the base — now home to the U.S. Strategic Command which deters "catastrophic actions from adversaries and poses an immediate threat to any actor who questions U.S. resolve by demonstrating our capabilities" — isn't safe from historic and record-setting floods. Intense rains on top of the rapid melting of ample snow has inundated large swathes of Nebraska and a full one-third of the Offutt Air Force Base, including the headquarters building. NASA's Landsat 8 satellite captured before and after images of the flooding — which the European Union Earth Observation Programme called "biblical." The overloaded river burgeoned in size, creeping into Offutt, neighborhoods, and farmlands." "Even A Polar Vortex Is No Match For Insects Adapted To Cold Conditions"
"Wisconsin's Frigid Winter Pressured Some Species, But They'll Rebound Quickly. With daylight saving time back in place and warmer temperatures knocking at our door, spring is finally crawling toward Wisconsin. The winter of 2018-2019 is one we won't soon forget — the season started out mild before temperatures plummeted with January's polar vortex. During the coldest stretch, our coping strategy might have involved layers of blankets and binge-watching Netflix, but what about the bugs? Questions regarding the cold-weather impacts on insects have been some of the most common at the University of Wisconsin Insect Diagnostic Lab over the winter. There will undoubtedly be some effects from the polar vortex, although many insect species are well-equipped to deal with the cold. Before we know it, overwintering insects will become active again in the Midwest and many species will simply shrug off the polar vortex as if it hadn't happened. As for insects that didn’t fare as well in the cold, high reproductive capacities will likely allow their numbers to bounce back relatively quickly. That means 2019 isn't going to be insect-free by any means — and intuitively this makes sense. It’s understood that every year, insects make it through the winter months and become active as temperatures creep up in spring. 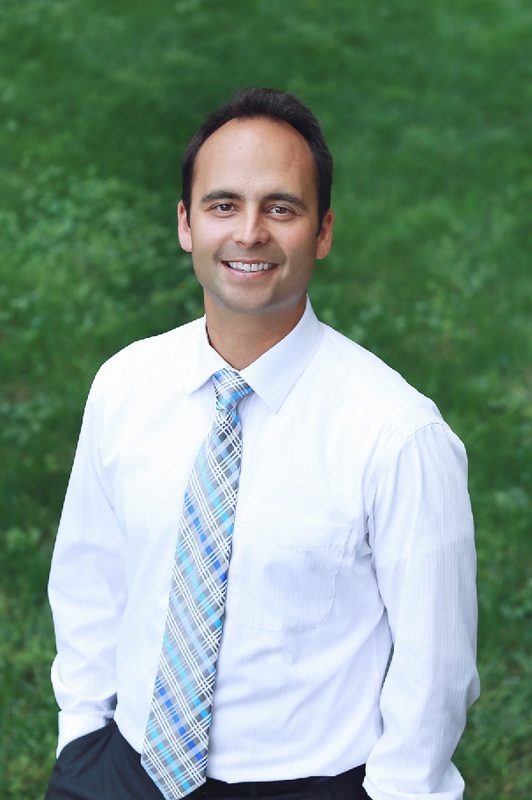 Looking at an evolutionary time scale, the January 2019 cold snap wasn't the first time insect species in Wisconsin have encountered frigid temperatures before, and many creatures are adapted to survive surprisingly cold conditions."